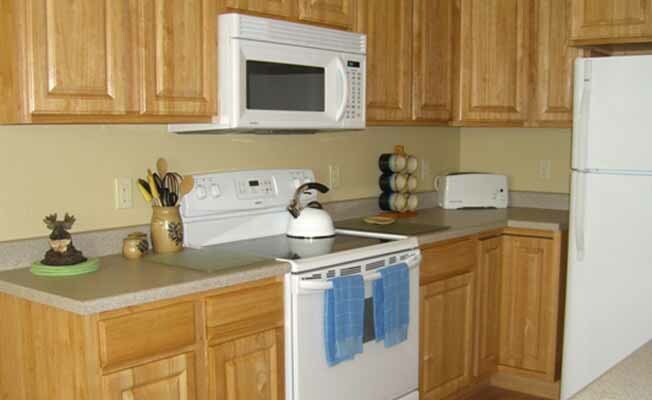 Happy Trails vacation condo is completely furnished, and has a fully equipped kitchen including disposal, dishwasher, built-in microwave oven, and a fridge with ice-maker, as well as dishware and cooking utensils. A washer and dryer are located in the condo. Our condo has A/C for those few hot Bozeman days. Ceiling fans are in each room. The living room is complete with comfortable leather furniture, a flat-screen TV, and a DVD/VCR combo. There are two master bedrooms, carpeted, each with a queen bed with 500-thread-count sheets and a full bath with ceramic tile floors. The living room, dining room, and kitchen have wood flooring. Happy Trails condo is one of only four condos on the second floor in a quiet complex. It is conveniently located at 19th and Durston, five minutes to historic downtown Bozeman with its many restaurants, coffee shops, art galleries, and boutiques. It is also just five minutes from Montana State University - Bozeman and from the world-famous Museum of the Rockies. It's a short 15-minute drive to Gallatin Field Airport, and only 20 minutes to Bridger Bowl Ski Area for skiing in the winter and hiking in the summer. Big Sky Resort is a one-hour drive through beautiful Gallatin Canyon, and Yellowstone National Park is just 30 minutes from Big Sky. Fly fishing and hiking trails abound in the area, as well as two public golf courses, Bridger Creek Golf Course and Cottonwood Hills Golf Course. On-Site Amenities: Air conditioning, bath linens, refrigerator, washer, dryer, ceiling fans, stove and oven, ice maker, heating, microwave, coffee maker, iron, ironing board, bed linens dishwasher, toaster, games for adults, games for kids, alarm clocks, radio, cable TV, CD player, DVD/VCR, Internet and off street parking. Activities and attractions: beach, public swimming pool, tennis, snowmobiling, groceries, whitewater rafting, biking, ice skating, restaurants, fly fishing, hiking, cross country skiing, golfing, snow skiing. Rates: Nightly $135 (3 night minimum), Weekly $800, Weekend $375. Rates are less during the off season. $300 security deposit is required. Half rental payment and security will secure your reservation. Full payment is due one month prior to arrival. Cleaning fee of $100.00 and 7 per cent state tax is additional to rates. Refunds are negotiable.